University High School offers enrichment summer camps for grade school, middle school, and high school students. Our camps cover everything from Minecraft to Mandarin and computer programming to creative writing. Course fees are $160 per week, but there are exceptions. See descriptions below for details. Explore your creative writing talents in this week-long camp! In the Creative Writing Camp, campers will cover playwriting and screenwriting, fiction, and poetry through fun games and interactive exercises. If you love storytelling and want an encouraging, supportive workshop environment, this is the camp for you! In the Film Production Camp, budding filmmakers will collaborate with one another to produce their very own films! In just one week, campers will learn to write, direct, and edit short films that showcase their unique talents. Aspiring writers, actors, directors, editors, and even composers are all invited. The camp will conclude with a special film festival showcasing these films. The French Language & Culture Camp provides a fun opportunity for students to explore the French and Francophone worlds through hands-on, interactive, and diverse activities. This camp will incorporate daily language lessons, cooking labs, French activities and sports, art projects, and an introduction to French and Francophone geography. No previous knowledge of French is required. Join Monsieur Hindsley to find out more about French! Calling all intermediate and advanced Minecraft players! 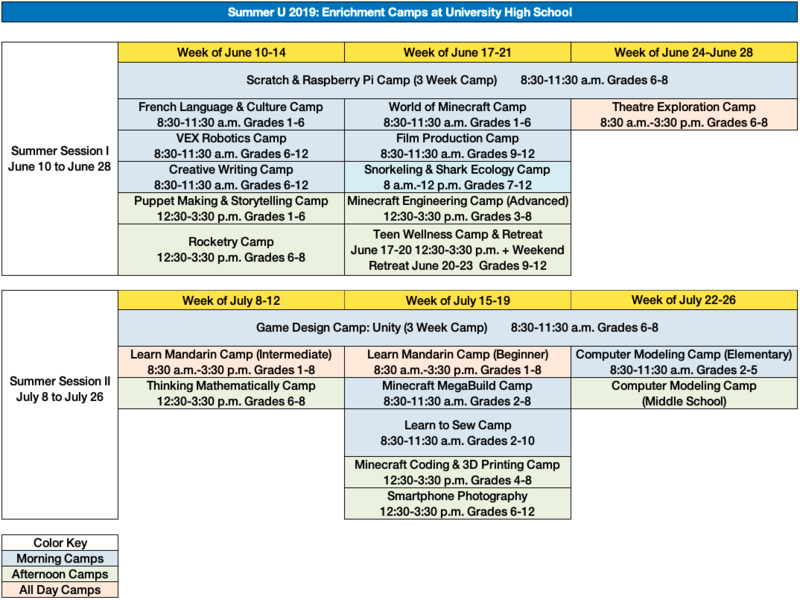 In addition to many of the activities and games presented in the World of Minecraft Camp, campers in the Minecraft Engineering Camp will learn advanced crafting skills, complex Redstone engineering, and how to install and manage mods. Campers will put their engineering skills to the test in both survival and creative worlds with individual and team-based challenges and games including Spleef, Skywars, Race for the Wool, and many more. Note: Campers will not need to bring a computer to camp. They are encouraged, though not required, to have their own Mojang Minecraft account so that they can try at home what they learn at camp. Parents wanting to provide a day-long experience for their child can register for both this camp and the World of Minecraft Camp that runs the same week. Puppets are popular around the world for telling stories and expressing ideas. In this one-week Puppet Making & Storytelling camp, campers will combine the art of storytelling with the creation of their own puppets. Campers will learn the craft of puppet-making and bring their puppets to life using storytelling techniques. In this one-week Rocketry camp, students will explore the science of flight and related topics including gravity, lift, thrust, and drag. Campers will build their own model rockets (theirs to keep) which they will launch at the end of the week. They will also explore related physics topics via labs and age-appropriate experiments. 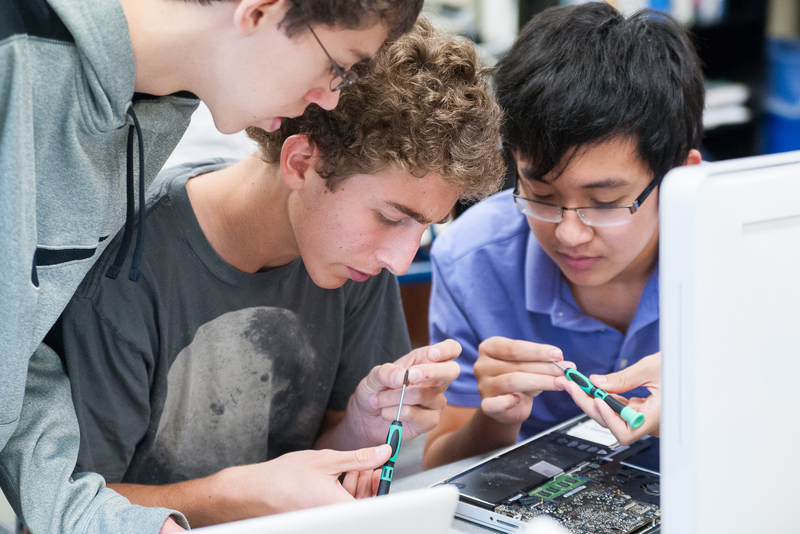 This three-week camp offers an introduction to the exciting world of computer programming. No prior experience is needed! Campers will spend the first week learning the basics of programming, with students making games in Scratch, a visual programming language. During the second week, campers will learn to program a Raspberry Pi computer to control circuits. The third week then introduces Python programming. In this unique and exciting camp, campers will gain knowledge of shark ecology as well as hands-on skills and certification to snorkel in an open water environment. The week will be split into two “dry land” classroom sessions at UHS and three “wet” pool sessions, hosted at the Fort Benjamin Harrison YMCA. Two pool sessions will be dedicated to learning the fundamental skills of snorkeling. In the third session, students will improve on their skills and also experience a Scuba Diving trial. Transportation to pool sessions will be provided from UHS. Students should be comfortable in the water and capable of passing a swim test. Get an inside look at the wide world of theatre! In the Theatre Exploration Camp, campers will learn a variety of performance and production skills from several local artists. Campers will spend time exploring everything from make-up design to improv, from puppetry to musical theatre. This week-long experience will expand any young artist’s mind in every aspect of theatre. Do you like robots? Do you want to learn more about them? Come join us for the VEX Robotics Camp. Campers will get hands-on experience building robots using VEX materials, and they will see how their robot stacks up in an in-class competition. By the end of the week, campers will not only walk away with fun memories, but they will also have useful experience in building, programing, and driving really cool robots! Students will explore a variety of wellness practices, including healthy eating, exercise, yoga, rest, meditation, reflection, and other mindfulness practices that will educate, empower and inspire students to take more control over their physical, mental, and emotional wellbeing. After learning about the benefits of a variety of wellness practices in the classroom setting, students and retreat leaders will spend a weekend at the Lost River Hostel in West Baden, IN to disconnect from technology and become fully immersed in nature while enjoying activities such as swimming, hiking, community building, and self-exploration. Saturday, June 8 only, 8:30-11:30 a.m. Girls, hone your basketball skills this summer! UHS Girls Basketball Camp is an opportunity for campers to understand and experience what it is like to be a University High School girls basketball player. Campers will grow and gain a better understanding of basketball in a welcoming environment, Coach Blanding and his assistants will teach, push, and encourage campers of any skill level in all aspects of basketball. Join the adventure that is Minecraft in this exciting camp that will immerse students into the game they love. In the World of Minecraft Camp, campers of all skill levels will play a special educational mod of the game on a secure server where they will explore a vast interactive ancient world map complete with thrilling quests and adventures. In another activity, campers must work together in survival mode to design, create, and build an entire virtual community on a volcano island. Each day will feature a different set of challenges and games that will put the campers’ creativity and problem solving to the test. Note: Campers should be able to read simple on-screen instructions. Also, campers will not need to bring a computer to camp and will not need their own Mojang Minecraft account for this camp. Parents wanting to provide a day-long experience for their child can sign their child up for both this camp and the Minecraft Engineering Camp that runs during this same week. Have you ever wanted to create a video game character or make your own virtual house?! Come and join us on our adventure to use innovative 3D-modeling software to create whatever we want on our computers. Our camp exercises will start with stacking virtual LEGOs and end with creating our very own Space Shuttle! The skills that you and your new friends will learn in this camp session will prepare you all for things such as creating video games, using 3D-printers, and even architecture. Learn how to unleash the power of your computer! Come and join us on our adventure to use innovative 3D-modeling software to create whatever we want on our computers. Our camp exercises will start with molding virtual clay and end with creating detailed virtual gears! The skills that you and your new friends will learn in this camp session will prepare you all for things such as creating video games, using 3D-printers, engineering, and even architecture. Love playing games? Learn to make one in Game Design Camp: Unity. Campers will learn to use Unity, te leading game engine, to create their very own games. Spend the days exploring both 2D and 3D game development principles while also learning the basics of coding using C#. All code in this course will be done in C#. While no experience in programming is required, prior knowledge or experience is helpful. Mandarin Camp (Beginner) is a Mandarin camp for middle school students interested in learning the language. In this course, also called “Bilingual Buds,” students will learn basic, easy, conversational Mandarin Chinese alongside students their age. Students will learn the basics of the Mandarin language and explore Chinese culture and traditions through creative, high-energy themes incorporating arts, calligraphy, cooking, and traditional Chinese holiday celebrations. This camp requires no previous Mandarin experience and is a wonderful way to explore language learning in a week-long session. This camp is run by the China Melody Chinese School. Mandarin Camp (Intermediate) is designed for middle school students who are intermediate or advanced Mandarin speakers. Campers will acquire certain fluency in Mandarin, learn Chinese characters, develop self-confidence, foster independence, and become curious, life-long learners. This camp will offer a well-implemented academic and activity-based curriculum. This course is also called “Immersion Pros” and is run by the China Melody Chinese School. In this one week camp, kids from ages 7 to 16 will learn the basics of how to operate a sewing machine and complete three finished projects. Students will sew a stuffed whale pincushion, a pillowcase that they will then tie-dye, and a zippered pencil pouch. The classroom fee includes the use of sewing machines, all fabric, thread, and patterns needed to complete the three projects, tie-dye materials, and a mid-morning snack and beverage. Note: Campers are encouraged, but not required, to have their own Minecraft account. Parents wanting to provide a day-long experience for their child can sign their child up for this camp and the Minecraft MegaBuild Camp that runs in the morning. Camp DescriptionMinecraft players of all skill levels are welcome in the world of Minecraft MegaBuild Camp! Campers will work together on a secure server in creative mode to design and build a virtual modern city center complete with parks, retail, and residential spaces. They will learn about modern city planning along with design and engineering concepts related to building construction. Campers will also design and build various other Mega-Structures including skyscrapers, stadiums, and even a giant cruise ship. Note: Campers do not need a computer or a Mojang Minecraft account for this camp. Parents wanting to provide a day-long experience for their child can sign their child up for both this camp and the Minecraft Coding Camp that runs in the afternoon. Obsessed with your phone? Our Smartphone Photography Camp will teach you how to use your phone to take amazing photos for social media and more. Campers will learn the mechanics of constructing images, including composition and lighting, and they will explore our entire campus to find the perfect shot. Campers will also develop an understanding of the basic technical aspects and aesthetics of smartphone photography, and they will gain experience editing their photos using free apps. This week-long camp will focus on developing habits of mathematical thinking through rich problem-solving experiences. Topics will include investigations in number theory, paradoxes of infinity, mathematically-based magic tricks, studying strategies of a logic game, digital roots and modular arithmetic, mental math techniques, visual approaches to algebraic thinking, and fun challenging math problems that deepen an understanding of traditional middle school math topics.